The paper considers an antenna-matching device in the form of a transmission line segment (for the decameter range — a delay line composed of several segments of a low-pass filter). Depending on the phase of the reflection coefficient in a given section, additional capacitors may be connected to or disconnected from the segment. FANO, R.M. 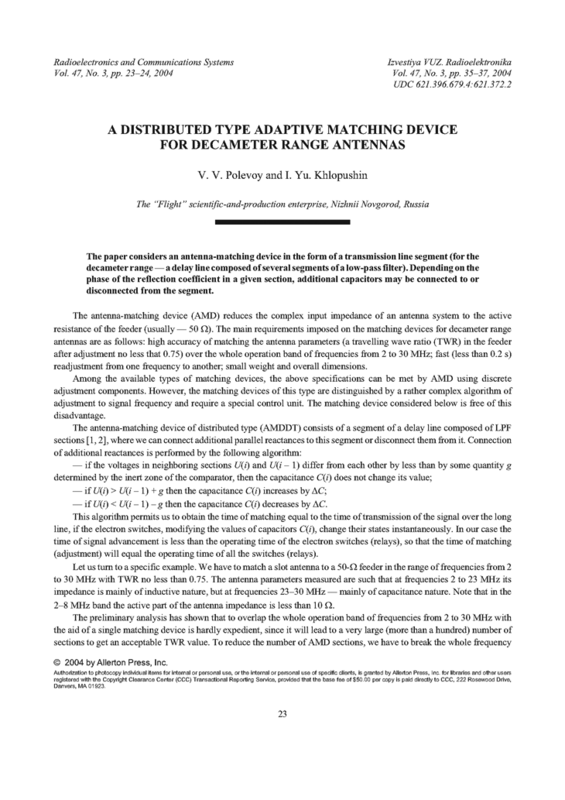 Theoretical Limitations on the Broadband Matching of Arbitrary Impedances. Tech. Report. Massachusetts Institute of Technology, 1948. MATTHAEI, G.L. ; YOUNG, L.; JONES, E.M.T. Microwave Filters, Impedance-Matching Networks, and Coupling Structures. McGraw-Hill, 1964.